Some of Europe’s most famous—and magical—annual Christmas markets wait to be discovered on the Danube. With every turn, you’ll find stalls lined with local crafts, traditional and tasty snacks, holiday ornaments, and spicy glühwein (mulled wine for those who don’t know), as excited chatter between locals and tourists mingles with angelic-sounding choirs singing carols and jolly seasonal spirit permeates the air. A gem of Europe’s Christmas markets is Nuremberg’s Christkindlesmarkt—said to be Europe’s largest and occupying the town center. Sip your glühwein and purchase items like Rauschgoldengel (gold-foil angels) and wooden nativity scenes to take home with you. Listen to brass bands and children’s choirs while you feast on Lebkuchen (gingerbread—some coated with chocolate and sugar and all made with sweet-smelling spices). Reserve a yellow stagecoach ride through the city, plus, visit the symbol of the Christmas market: Nuremberg Christkind—who will be hard to miss with her flowing blond curls, dramatic, towering crown, and white and gold attire. And no visit to the Nuremberg market would be complete without searching for what’s known as prune men: collectibles made from dried prunes, walnuts, and figs. Vienna boasts close to 50 Christmas markets, but the Rathausplatz city square holds the title as the largest. With city hall looming as its backdrop, Vienna’s Christkindlmarkt attracts millions of intrigued shoppers annually, who come for the music; weihnachtspunsch (another holiday drink, this warm Christmas punch is concocted with ingredients like tea, red wine, rum, fruit juice, and spices); and the 100-plus wooden market stalls brimming with tin ornaments, roasted maroni (chestnuts), and other crafts and fare to lure foodies and customers. 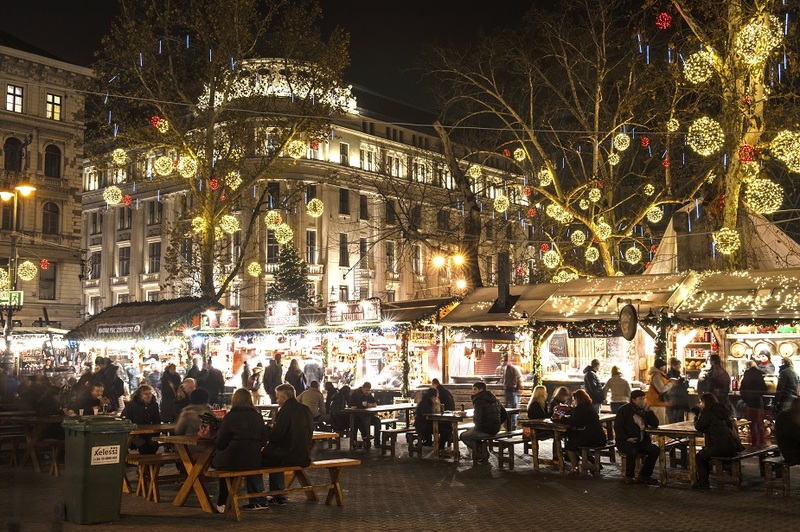 Vörösmarty Square hosts the oldest and most superb Christmas market in Budapest (though this is another city with more than one pop-up market). Here, engage with vendors at the stalls to pick up ceramics or carved wood crafts for a souvenir or holiday gift. Stay warm with mulled wine and nosh on fried sausages (this place knows its treats as well—try the traditional kürtöskalács or strudels). Soak in the culture by watching folk dances and live music on designated stages, hop aboard the Christmas Light Tram (each tram is allegedly decorated with 35,000-plus lights! ), and rest your feet at the famous Gerbeaud Café; always beautifully decorated, the café used to showcase an enormous Advent calendar (each day a new window was opened to great fanfare).